We had an especially painful contraction followed by an extraordinarily weak expansion. GDP growth should reach 5% in the recovery and prosperity phases. It’s been around 3% (at best) since 2008. 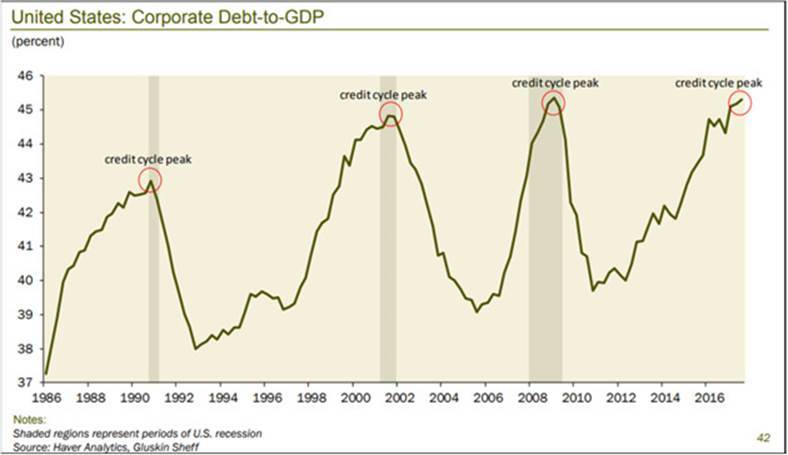 Further, since debt drives so much GDP growth, its cost (i.e., interest rates) is the main variable defining where we are in the cycle. The Fed controls that cost—or at least tries to—so we all obsess on central bank policy. Lower asset prices aren’t the result of a recession. They cause the recession. That’s because access to credit drives consumer spending and business investment. Take it away and they decline. Both are problems, but the second is worse. Experts tell me that Dodd-Frank requirements have reduced major banks’ market-making abilities by around 90%. For now, bond market liquidity is fine because hedge funds and other non-bank lenders have filled the gap. Worse, I don’t have enough exclamation points to describe the disaster when all high-yield funds try to sell at once and at fire-sale prices to meet redemptions. To make matters worse, many of these lenders are far more leveraged this time. They bought their corporate bonds with money borrowed at record-low rates. And they’ll continue doing so as long as central banks keep them low. Put simply, the borrower doesn’t have to repay by conventional means. Sometimes it can even force the lender to take more debt. This means the macroeconomic effects will spread even more widely.